“It's easy to tell the two most famous Danes in showbusiness history apart: Hamlet was the melancholy one and Victor Borge definitely wasn't. The man frequently referred to as 'The Clown Prince of Denmark' was an incredibly skilled pianist who also happened to be a highly gifted comedian. 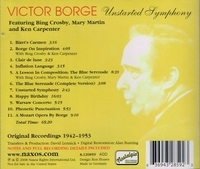 Although his period of greatest popularity in North America was probably during the decade in which these recordings were made (1942-1953), his career continued successfully for nearly another half century and he was still performing sixty concerts in the year of his death, 2000, when he was 91. The secret to his success is that what he did was incredibly complex, but he made it all seem blissfully easy. Long before Dame Edna, he knew how to insult and interact with his audience. Ages in advance of P.D.Q. Bach, he understood the humour to be mined from mocking classical music. And yet he never forgot that the public always had a long-standing love affair with serious virtuoso pianists and so he made that element a part of each show as well. If anyone wondered how Borge was able to combine all these elements so fluidly, the answer is simple: he'd been doing it all his life. He was born Borge Rosenbaum in Copenhagen, Denmark on 3 January 1909, the son of musicians Bernhard and Frederikke Rosenbaum. His father played violin in the Royal Danish Philharmonic Orchestra for 35 years and one wonders if the paternal career inspired the later filial joke: 'The difference between a violin and a viola is that a viola burns longer'. By the age of three, young Borge was taking piano lessons and soon after he revealed the combination of musical angel and comic devil that he would delight in for the rest of his life. His parents would encourage him to entertain their dinner guests and Borge would announce he was about to play a Beethoven sonata, only to launch into one of his original compositions, delivered in the style of Beethoven. He would then egg the guests on to enthuse about how that had always been one of their favourite Beethoven pieces, exposing the hypocrisy and shallowness in these so-called musical experts. He studied piano under a full scholarship at the Royal Danish Academy of Music and made his classical concert début when he was only seventeen. But the totally serious world of music had no lasting appeal for him and by the time he was 24, Borge was appearing on stage as a musical comedian and starred in as many as four Danish films in one year. His popularity as a performer grew rapidly, but so did his acid tongue and as the Nazis became more powerful, he made it very clear what he thought of them. 'What is the difference between a dog and a Nazi?' he used to ask and then provide the answer. 'A Nazi lifts its arm'. After the German invasion of Denmark in 1940, Borge found himself near the top of the Nazi Enemies List and he left his homeland just in time, sailing on the U.S.S. American Legion, the last passenger ship to leave Europe. When he arrived in America, Borge was broke and spoke not a word of English. He assumed the stage name of Victor Borge, learned the language by watching movies night and day and within a year, made his professional début on Rudy Vallee's radio show. 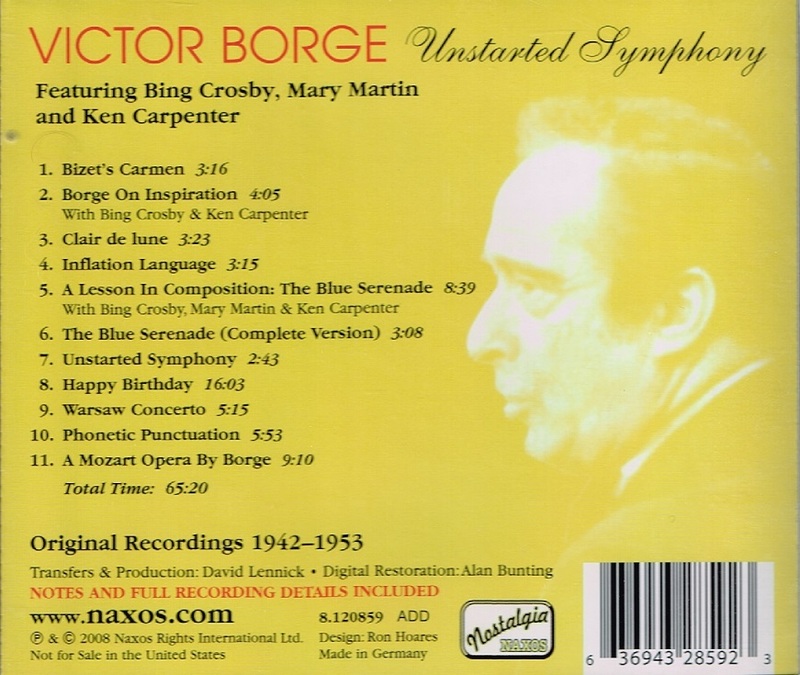 By the next year, Bing Crosby had hired him for his Kraft Music Hall and some of the earliest recordings on this disc (‘Borge on Inspiration’ and ‘A Lesson In Composition: The Blue Serenade’) come from those first appearances. Listening to them it's amazing to see how quickly Borge assembled his North American persona and then polished it over the following decades. He was named Best New Radio Performer of the Year in 1942 and made his first American film appearance in 1943 opposite Frank Sinatra in the film ‘Higher and Higher’, playing several classical concert pieces during the film. 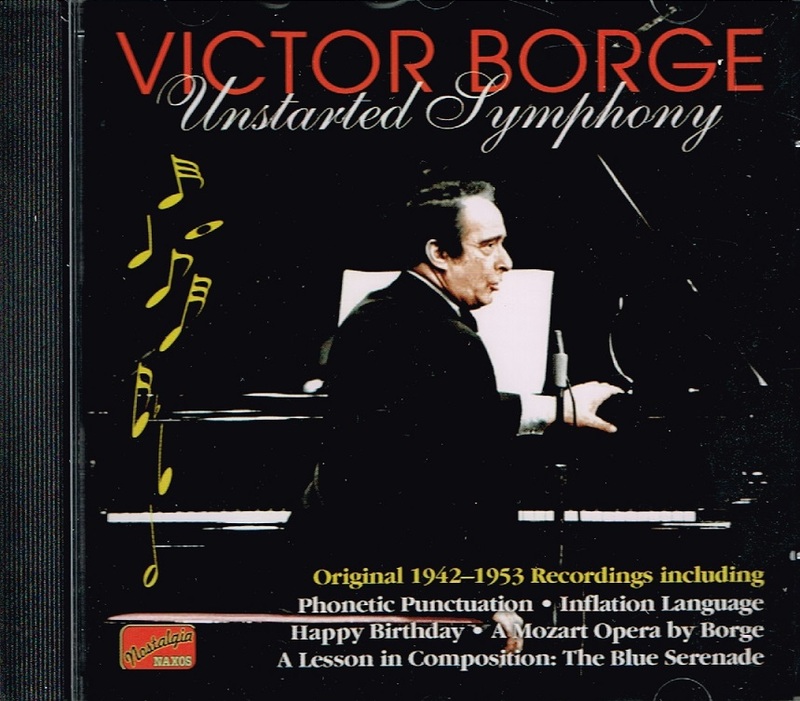 By 1946, he launched The Victor Borge Show on NBC and it was over the next few years that many of his signature pieces heard on this recording were created. ‘Inflation Language’ was one of his wittiest, a verbal tour de force about forcing up the values of numbers that appear in everyday speech, with 'Once upon a time' becoming 'Twice upon a time' and – most memorably – 'Tea For Two' turning into 'Tea Five Three'. He also learned the knack of delivering a Reader's Digest Condensed Books version of the world's great opera, like the three-minute-and-fifteen-second version of Bizet's CARMEN that begins this recording. Perhaps his greatest triumph was ‘Phonetic Punctuation’, in which he provided deliciously comic sounds to indicate the presence of commas, periods, dashes, etc. The recording of that particular number heard here is from 1953 and when the audience realize that's what he's leading into, the delighted murmur of recognition indicates the impact it must have generated in the six years since its creation. One of Borge's other great successes was his ability to play ‘Happy Birthday’ in the style of whatever composer the audience chose – a clear throwback to his childhood days when he convinced people that a Borge sonata was by Beethoven. The arrival of television only added to Borge's success, as he introduced an inspired element of physical slapstick that caused many critics to refer to him as one of the world's great clowns. He would fall off the piano bench, play chords with his backside and generally create an atmosphere of controlled pandemonium that audiences found irresistible. Borge finally assembled his 'Greatest Hits' into an evening called ‘Comedy In Music’ which started touring America early in 1953. Some of the selections on this disc are from the Boston run in February of that year. He finally brought his masterwork to Broadway, where it ran for 849 performances at the Golden Theatre, which remains a record for a one-man show. From then on, Borge found a groove that he would work the rest of his life. He would present variations on ‘Comedy In Music’ around the world for the next 45 years, playing to delighted audiences everywhere. In his later years, he often appeared as a guest conductor with some of the world's great symphony orchestras, bringing him back to his roots. He died peacefully in his home in Greenwich, Connecticut on 23 December 2000, having just returned from yet another successful concert tour. If you want to sample both sides of Borge – the serious artist and the jester – then listen to his exquisite recording of Debussy's ‘Clair de Lune’, made in 1947. And right after that, recall his famous comment: ‘I only know two pieces of music. One of them is 'Clair de Lune' and the other one isn't’."